If you could sum up Texas Dreams in three words, what would they be? Jean Brashear brings the characters and community to life in a way that you just want to invite them into your home and your heart. Ruby decides to plan a surprise wedding for Scarlett and asks for help from Maddie. Maddie calls Scarlett and suggests they plan a surprise wedding for Ruby. The whole town gets involved. I love the other people we've read about being involved. Eric G. Dove does a great "Ruby". He makes her sound so fiesty. 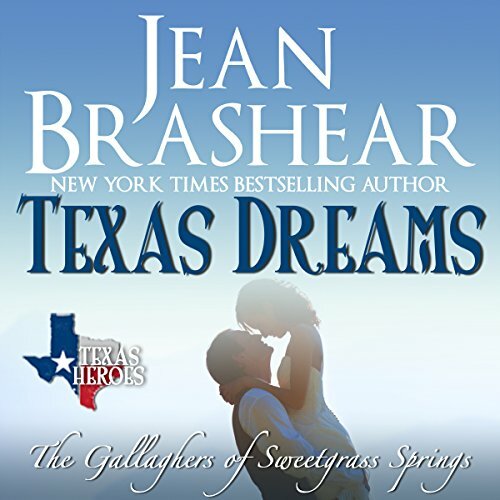 I'm wondering if this should have been called Texas Secrets instead of Dreams, but that is another Jean Brashear book. This book was full of secrets. Secret weddings, secret conversations, secret meetings, secret feelings, etc. But, it was also a book full of humor, family, friendships, love, and loyalty. There is still the underlying mystery of exactly what it will take to ease "the Lady's" sorrow. Ian and Scarlett. Arnie and Ruby. Will either wedding go on as planned? What will be the reaction to the mystery guest? Will Jeanette get a man of her dreams, and a career she would excel at given the chance? This is a standalone with a HEA. So many other stories can evolve from it. I read this a few years ago in a Sweetgrass Springs Box Set, and I recently listened to the audio book. The narration was excellent, and just serves to enhance the enjoyment of the story. It is so interesting to me that a book I already read and enjoyed can be refreshed and enjoyed again by the audio version. I guess that just proves that the narrator, Eric G. Dove, is good at what he does. I voluntarily listened to and reviewed the audio book version. Jean Brashear makes sure that family takes center stage within her Gallagher and Marshall series. Her stories are a celebration of love, whether it be the connection between blood relatives or branching out into starting a love match, each character shows the beauty and the heartbreak of the most flawed emotion in the world. Texas Dreams is a humorous look at why family is so important. It's the chance to leave a mark on life, love and happiness. Family are the people who help get you through the tough spots, helping you become your greatest self. There is plenty of heart in every emotion conveyed as the Marshalls and the Gallaghers become one big united, heartwarming, unforgettable family. I love this series, thus book is no exception! This book bring past and new characters together. The planning and scheming to pull off two wedding was fantastic. Revisit our favorite couples and how Sweetgrass Springs is coming along. Not all is coming up roses for Ian and Scarlett. I love this narrator! I voluntarily reviewed a copy of this book. I absolutely LOVE Jean Brashear's books. I *think* this one is my favorite so far! It's really hard to choose. But seeing so many of her characters in one place makes this one so special. What a great read/listen. Even though I've read her books, listening to them is SO worth it. Eric Dove does such a great job. How he keeps so many "voices" straight, I can't imagine. He is so talented and does an excellent job. Can't wait for the next story!!! This is a fun, laugh out loud story about the best and worst kept secret in Texas! Maddie, Ruby, Scarlett and the rest of the Gallagher clan plan two weddings while trying to keep the secret from each bride. The grooms find out, however one of them is more than a little hesitant at the deception. Funny scenarios and antics prevail and it is wonderful to have everyone together in one book. This is a book not to be missed! Eric Dove does a fabulous job of all the voices, so sit back and enjoy this great installment to this amazing series.